How much does it cost to hire a campervan? 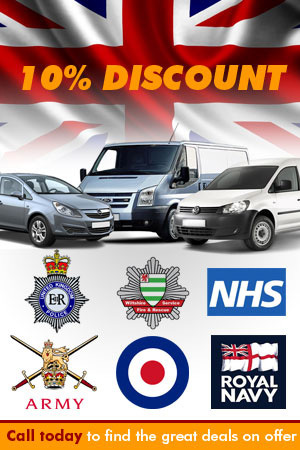 All prices are fully inclusive with no hidden extras. We have the newest and most luxuriously equipped campervans and provides the highest levels of customer service. NB Prices may rise during bank holidays, Easter and Christmas. Please contact us for a quotation. There is a minimum hire period over Christmas and New Year and for festivals such as Glastonbury and Festivals, please call to discuss. Please contact us if your booking is within 1 month of departure. Prices include Value Added Tax (VAT) 20%, insurance, roadside assistance, unlimited mileage and satellite navigation. Long Weekend breaks - Friday pick up and Monday morning return. Additional Drivers are free, subject to insurance approval. If you are traveling to Europe we charge an additional fee which includes European insurance cover, roadside assistance and legal compliance (European travel kit spare bulb/fuse set warning triangle, high visibility vests, first aid kit, fire extinguisher etc.). NEW From the 1st July 2012 includes NF Legal Approved Breathalyser kit. Insurance is provided and in the event of any damage to either the vehicle or third party property the hirer will be liable for the first £1,000. The hirer will be liable for replacement or repair of windows or tyre damage and accidental/negligent damage to fittings and equipment. Collision damage waiver is NOT optional your insurance excess is £1000 Inc. VAT. Insurance excess does not include the replacement or repair to the roof, undercarriage, windows, tyre damage or accidental/negligent damage to fittings and equipment. The prices quoted are for drivers between the ages of 30 and 70 holding a driving licence for at least three years with no accidents or endorsements’. Drivers under 30 or over 70 are charged an additional loading of £50 per day, subject to insurance approval. Drivers outside these conditions will be considered but there may be additional charges. Please call to discuss. Drivers with 3 points or more may incur an insurance surcharge, please call for a quote. 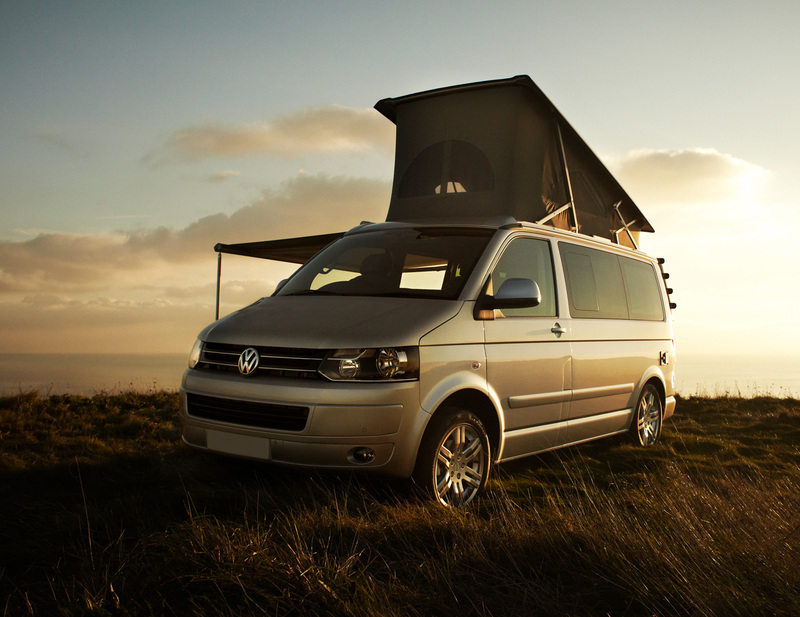 Our campervans are modern 4 berth Volkswagen T5.5 GP VW California’s, factory produced and maintained by VW, they are the very best and they are the only campervans available that are 100% Volkswagen. 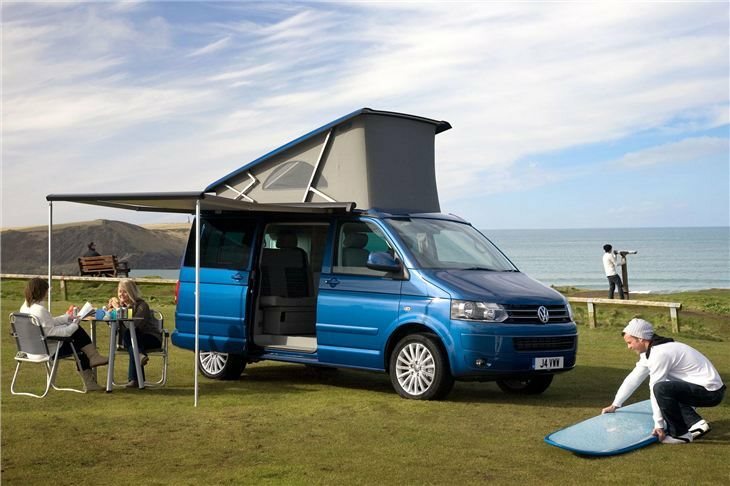 The California campervan is packed with safety features and technology that brings camper vanning to the 21st Century. They include an electrically powered pop-up roof, providing full head height for on board catering and the swivelling front seats makes mealtimes more sociable with everyone around the foldaway table. The pop-up roof also provides a super comfy double bed and the lower seats convert in to a second double bed in the main cabin perfect for up to four adults. 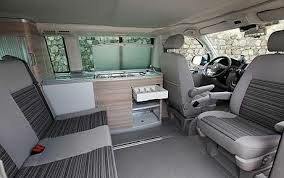 The VW California has a sink, a 30 litre fresh water tank, 42 litre fridge, double gas ring cooker, parking sensors, air conditioning, built in programmable diesel heating system. DAB radio with media ports for MP3 players and iPods. We also include satellite navigation, and a fully equipped kitchen to ensure that you have everything you need for a comfortable, relaxing journey and great camper vanning experience. We include everything you need …. DAB Radio with media port for IPods etc. …and we’ve even thought about the kitchen too!